The farce that was the arrival of the 2004 facelifts of the Rover 25/MG ZR, 45/ZS and 75/ZT will probably haunt anyone who worked at MG Rover for years to come. If you don’t remember it, then cast your minds back – MGR fans were eagerly anticipating the arrival of the new cars, the company had been struggling to get them out, and after flogging away behind the scenes, managed to ready the cars for introduction. A date was set, embargoes were created, and fans with an appetite for the new were on tenterhooks… and then, three days before the official announcement, Rover’s own advertising in the London Evening Standard and Daily Mirror, revealed the new cars in their grainy monochrome glory. Oh dear. The idea of freshening up these rapidly ageing cars was a sound one – and on the whole, the way they ended up looking was a step in the right direction. For the 75, the facelift was necessary, as it was still Longbridge’s star car, its prize possession, and although sales had been on the slide since the end of 2003, when the Phoenix 4 pension debacle went public, it was still very much a force within its sector of the UK market. The 2004 front-end styling was controversial, though. The majority of models received a fairly low-key restyle, which played down the Rover’s heritage by shrinking the grille, and upping the plastic content. It might have looked sleeker, but few 75 fans preferred it. However, the 75 V8‘s more imposing full-depth affair – although initially harder to stomach – was judged to be more successful and fitting of the marque. But this facelift was always meant to be a halfway house to the more thorough re-engineering job being done on the 75, which was due to bear fruit in 2006. The main thrust of the 2006 model was to see the replacement of BMW’s M47 turbodiesel in favour of Powertrain’s impressive G-Series engine, which had started out unpromisingly in testing, but which had emerged as a fitting common rail-fuelled replacement. 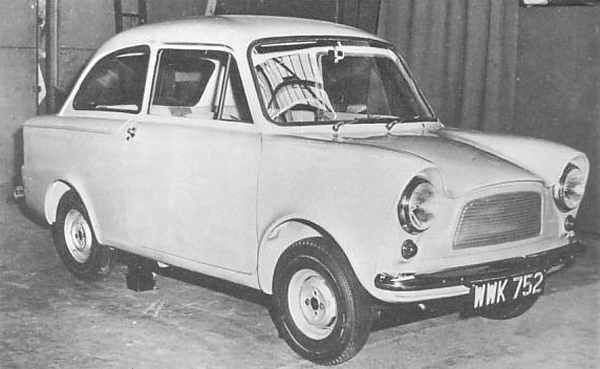 There were to be many other improvements, too, but the external styling was to receive a much more thorough going over, as these images clearly show. According to a couple of sources, this car was to also incorporate a 103mm stretch in the wheelbase to improve rear room as well as improve the already impressive chassis settings. New door pressings were being developed to meet this need, although according to Lee Mitchell, this was never in his design brief. What we do also know about this car is that a revised interior was being developed, and the dashboard had been previewed in the 2004 Rover 75 Coupe proposal. It was this car that became the basis of the Roewe 750. Certainly, there’s a resemblance around the headlamps and in the grille shape that’s hard to ignore, and according to Lee, it was rendered to full-size in clay, and it looked a real step forward. Still preferred the original MK1 version over the actual facelift in 2004 – and this later facelift proposal. Lee Mitchell’s 2010 etchings looked promising though! 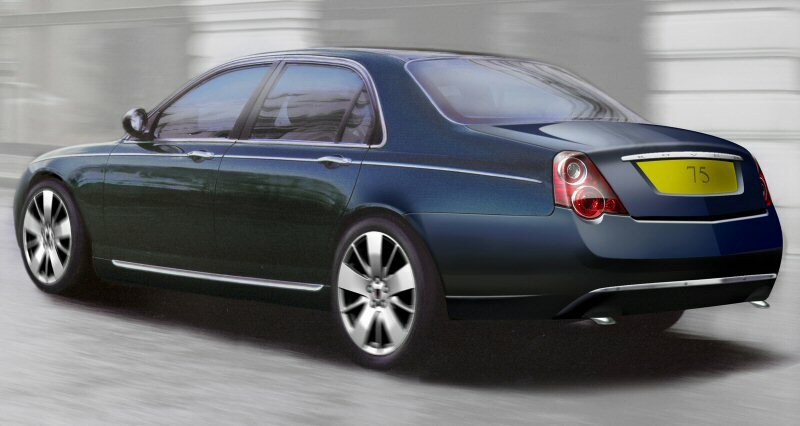 In tandem with Hilton Davis’s sentiments, I, too, prefer the pre-facelift Rover 75. The facelifted model lacked prescence, although the Premium front bumper design as used on the V8 models, wasn’t that bad. The first shot of a proposed frontal enhancement definitely does not float my boat. If they had knocked a car out like this from maybe about 2000 to 2005, it would have knocked the socks off the general public… And I strongly believe MGR would be still with us and doing well! If Rover had launched a car like the(bottom shot) they would have owned the market never mind anything else. Stunning. And oh boy am i reading a good book about BAE/Honda/Rover/BMW-an eye opener! That car in the bottom rendering is stunning – compared with the heavy-handed and generally fugly Chrysler/Lancia Thema, this has style, elegance and presence in bucket-loads……another of the great MGR ‘could have beens’……. Hang on though. 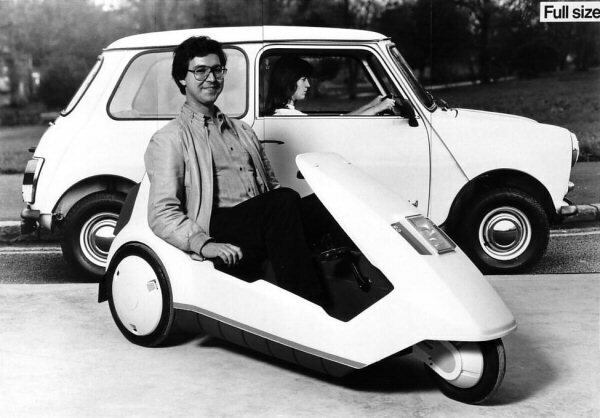 Where would this car have fitted in? Suddenly going from 3 series sized to 5 series sized but looking much the same. I think once again Rover would have ended up with an oddly sized car that the market didnt understand. The range would have existed of the ageing 200 – neither Fiesta or Focus, the positively ancient 400, overlapping the 200 and then a massive gap to this. If Rover had limped on into 2006, I reckon this would have absolutely finished it. I don’t care for either facelift proposal, but the bottom one looks like one of those chariacature cartoons, especially with those hideously inappropriate wheels. 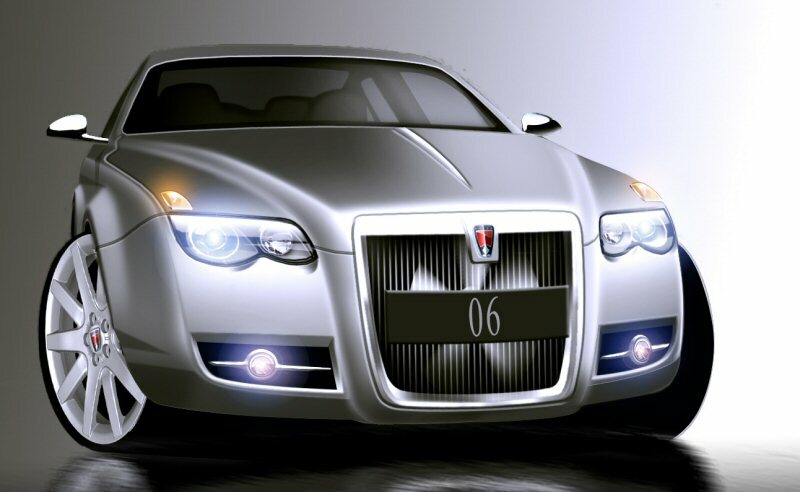 Lee’s proposal looks very Chrysler 300. A car with character and presence (and, it is rumoured, inspired by the P5). The 75 has its detractors mainly opinions against the ‘retro’ look of the original. Well, it’s a personal thing. Art: you like it or you don’t. Design’s the same. For me and I suspect most 75 lovers the pre-facelift was just a sublime piece of design. Somewhere on this site (I can never find it when I want to) is a 45 butched-up to look not unlike a 75 and, to my mind, was close to where Rover should have gone with the car. Not the facelift and far less any of these more ‘industrial’ versions suited the rounded classy look of the main body shape. All fine and interesting and correct, but for a very different car. I still look at the 75, particularly the early ones, and see an almost timeless design. It was, for those of us who appreciated it, as near perfect as could be. From the front, the back, the side: Richard Wooley created a masterpiece and I for one thank him for it. @13, “END OF THE ROAD” The true story of the downfall of Rover. Brilliant read, made me wipe my mouth over some things, notably BMW. It strikes me that there is a terrible styling mismatch between the traditional rounded form of the central section and the angularity of the new front and rear (photos 1 & 2). Trouble is they needed fresh metal but had nothing to offer – if only earlier negotiations had led to a proper partner without having to try to negotiate with the Chinese – which is seldom a fruitful process…..
Looks like another R17 to me, heavily facelifted but not heavily enough to disguise what lies beneath. If they’d managed to last long enough to release this it would have been just another milestone on the road to the inevitable. Of course that it’s something totally subjective, but I still think that the 600 was much better looking even by today standards. Just spotted one yesterday and what a beautiful car! In the other way, the 75 just like the much more beautiful S-Type, looked much more like a step backwards rather than forward, specially compared with the 600 and the XJ40/308. Better they took it out the back of the shed and shot it, repeatedly, in the face, with a chaingun! Seriously the further you go down the more horrific it gets. The last one looks like a Chrysler 300C penned by the car designing equivalant of Amon Goeth (look him up, not a pleasant chap by all accounts – surname is pronounced ger-ter by the way). It looks just about bearable from the back in the dark blue picture, but even that looks like someone bolted on some e-bay specials light clusters from China. The original 75/XT was such a pretty car – these ‘updates’ are soul crushingly horrible. That M47 by any chance wouldn’t be the Diesel version of the E47 thats currently well known for its habit of being installed backwards and eating cam chains like K-series eat Head Gaskets? I mean – you are putting an engine in a make of car built for the people with the heaviest right boots known to man & you put in a single run cam-chain? backwards? so it takes over 8 hours to remove, repair & replace? I think BMW might be borrowing more from BL than we thought – who’d have thought ripping off the SD1 came with a side order of Marina’s Revenge…? #20 : actually, his name was Goth, with an umlaut over the o, and it is pronounced Gert . You are confusing the pronunciation with that of the poet Goethe, a different kind of creature altogether ! I see a lot of Lancia Kappa in the first photo, but then again I like all the proposals. I have always liked the 75 from the start of prodiction and did like the face lifted model but it did need updating a bit more than it recived in 2004, I think the 3rd styling change for the Rover 75 would of made a lot of sense and would of sold. But to put such a design change into production would of cost a bit and the sad finacial state MG Rover were in could they afford to of done this!!! I have always had a soft spot for Rover and have had a few, all reliable, early 216 Vanden Plass leaked a bit and rusted but the later one I had didn’t and was very well built. Its sad to see all our Uk owned car industry gone RIP MG Rover. The BMW influence vs independence.